As enterprises build out hybrid cloud environments, many customers are looking for a seamless bridge between public cloud providers and physical data centers. Today we’re announcing that we have extended our partnership with Equinix to help customers close the gap between their public cloud services and on-premises IT. Through this expanded alliance, Equinix will offer Microsoft Azure ExpressRoute in 16 markets globally, spanning four continents. Equinix is also opening an ExpressRoute preview site in London. ExpressRoute is currently available to select customers as a “public preview” at Equinix IBX data centers in Silicon Valley and Washington, DC with general availability expected later this spring. The service will then be rolled out in multiple metro areas in Europe, Asia-Pacific and South America throughout 2014, which will ultimately allow enterprises to quickly deploy hybrid environments in new markets while insuring a globally consistent experience to ExpressRoute. ExpressRoute is designed to help maximize customers’ on-premises investments by cost-effectively and more securely extending their network beyond their existing data centers and enterprise IT infrastructure. Connecting to Azure through Equinix allows enterprises to bridge their cloud and data center strategies, benefiting from full integration between cloud services and internal applications. 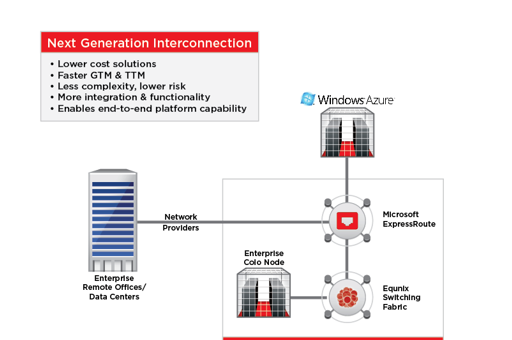 Both companies have worked to integrate Azure cloud services with private secure connectivity via an Equinix switching fabric that provides virtual connections with near real-time provisioning across fully redundant paths to and from Microsoft Azure. The combination of private access, intelligent interconnection capabilities, and a choice of private network connectivity options, enables Azure to appear as seamless extension to a physical datacenter, providing the scale, flexibility and economics of cloud, while reducing the complexities associated with network interconnection. We are excited to embark in the next phase of our partnership with Equinix as we work together to make building a hybrid environment simpler and more secure. If you’re interested in reading more about the partnership, check out Equinix’s blog post.